I tend to go on little project kicks in Winter, which is weird because I tend to decide to knit sweaters in summer, but whatever, it's a hobby and it's supposed to make me happy. And I am working on a sweater, but I have hit the dreaded sleeves. The yarn is Woolarina, a merino with some silk and cashmere thrown in, that I picked up at the Crafty Bastards fair. 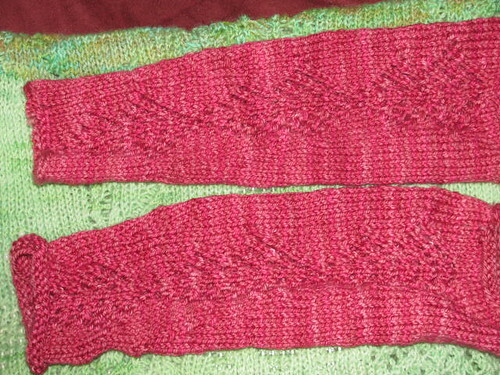 The pattern is the Arrowhead Arm Warmers from Interweave Holiday 2008 issue. If I made them again, I would probably throw in a thumb-hole, but they are lovely as is. Since I was using a slightly chunkier yarn - I knit it on fours, I cut off some of the space that is supposed to occur at the top, but otherwise left the pattern pretty much as is.